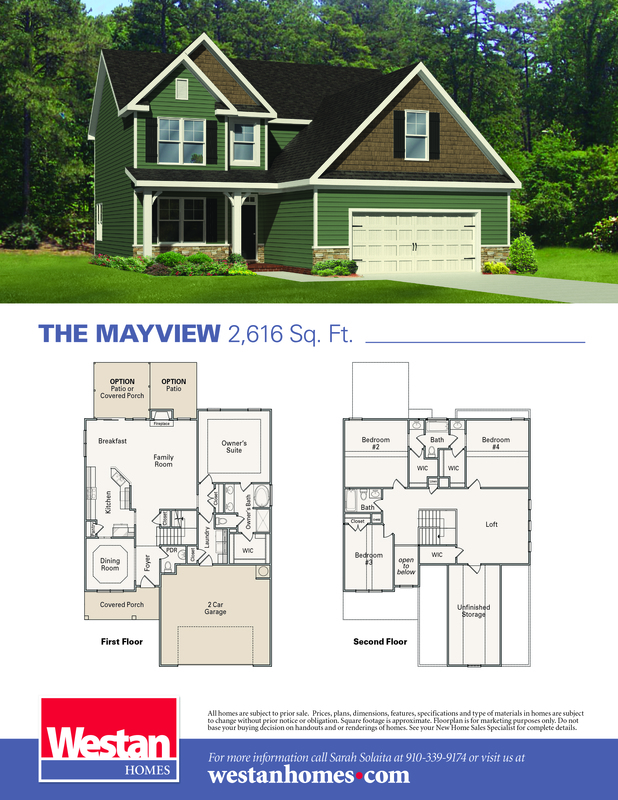 The Mayview plan features 2,616 square feet of living space. Enter into a beautiful 2-story foyer with the formal dining room off to one side and your half bath on the other. The large kitchen offers abundant countertop space and features a bartop overlooking the breakfast nook and family room. The first floor Owners Suite offers his and hers vanity, large soaking tub and separate shower and huge walk in closet. Just off the garage is the laundry room which completes the main floor. Upstairs you will have 2 bedrooms with everyone's favoriteJack and Jill full bath, as well as another bedroom, a second full bath and a large playroom or additional family room! You will also find a huge unfinished storage area that is a perfect location for the christmas ornaments! Just like all Westan Homes The Mayview features our Bright Ideas that come standard such as USB Charging Stations and Pull Out Trash Cans! !